Renaissance architecture spread not only through the construction of prominent buildings, but also through the publication of illustrated treatises. These books taught how to design in the ‘new’ classical style, particularly through the proportions and proper use of the five orders. 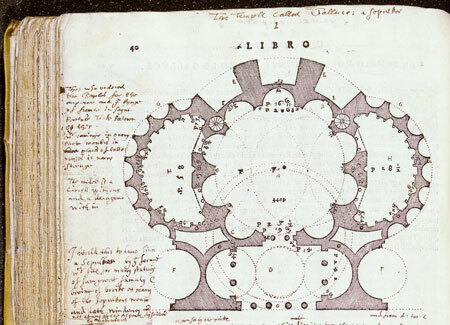 The most widely-read texts included Vitruvius’s De architectura, the sole surviving ancient work on the subject, and those of the Renaissance Italian architect-theorists who followed in his wake. These works presented an elevated and ennobled image of the art, inspired by the humanist’s admiration for classical antiquity. The first English architect to shape his work and professional persona in this mould was Inigo Jones (1573–1652). Jones travelled to Italy for two long periods of observation and study, but his approach to architecture was equally shaped by Italian treatises, which he collected and read with great care and attention. Worcester College, Oxford has the largest surviving remnant of his original library, with 46 of Jones’s own books, many laden with annotations in his hand. These notes show Jones not as a workman but an active intellectual, forming his own response to classical architecture through reading and writing.